If you are keen to use organic skincare then you need to look at product labels and websites for signs of organic certifications from a recognised association. You will need to keep in mind that each organisation has different guidelines as to what qualifies a product organic. The Soil Association, UK - A product must contain a minimum of 95% organic ingredients but if it contains more than 70 per cent organic ingredients, it can still be certified by the Soil Association, so long as the exact proportions are stated. NaTrue, European Union - non-profit organization formed by natural cosmetic manufacturers in Europe. NaTrue has created 3 levels of certification (was a 3 star system) as follows: 1) Natural Cosmetics - Ingredients must be natural but they do not have to be organic (from organic cultivation). This level is the foundation of the NATRUE-Label: it defines which ingredients are permitted and how they may be processed. Products of the other two levels need to fulfil the criteria of this level first. 2) Natural Cosmetics with Organic Portion Natural cosmetics containing ingredients of organic origin:at least 70% of natural (and/or derived natural, where applicable) ingredients must stem from controlled organic production and/or controlled wild collection. 3) Organic Cosmetics - At least 95 % of natural* (*and/or derived natural, where applicable) ingredients must come from controlled organic cultivation and/or controlled wild collection. Eco-Cert, France - Requires a minimum 95% of natural ingredients and a maximum of 5% of ingredients of synthetic origin. 10% of total product by weight (including the weight of water) must be organic. USDA Organic, USA - a highly stringent set of organic standards for food manufacturers that requires at least 95% organic ingredients to use the "Organic" logo. Products that use 100% organic ingredients can use the "100% Organic" logo. Organic Farmers & Growers - Further information on The OF&G Certification Scheme for Cosmetics and Bodycare Products can be found here. Now you know the certification logos to look out for you have to be aware that there are organic "fakers". Having a product certified organic is costly so I understand why smaller companies don't take the plunge. However, I see a growing number of smaller businesses not displaying logos but instead simply claiming and promoting "made with certified organic ingredients". Also using the word "Organic" in the name of your company portrays an image to the consumer which could be misleading, as with the Boots case I mentioned earlier. Some companies even going so far as to use made up logos (I shall not name & shame but I have seen this recently). So why the fuss? Let me explain that saying a product uses certified organic ingredients is not the same as having the final product certified. One obviously way to spot an organic "faker" is to look at the non-organic ingredients. There are strict guidelines for the preservative systems which are allowed and they must meet toxicity and biodegradability standards e.g if you see parabens then you have a faker on your hands as these ingredients would not be allowed by the Soil Association. Getting a product certified also involves a set of procedures such as auditing the factory, batch testing products and ensuring correct labelling and packaging. 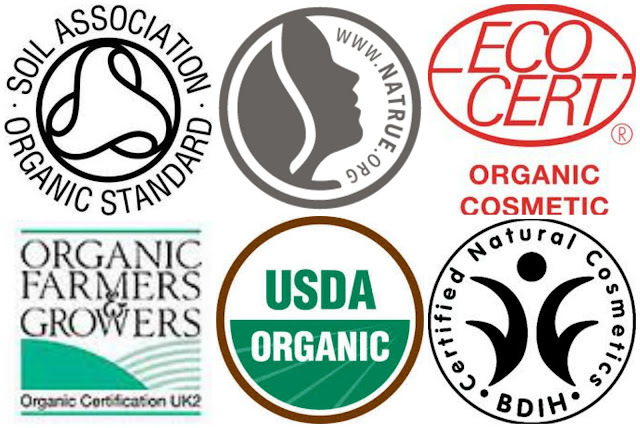 If buying organic skincare is important to you then purchase from Companies who are certified by a recognised organisation. If you are happy to buy from companies not accredited then make sure you read the labels and understand the true organic content. I see no reason to pay over the odds for a product which has only two certified organic ingredients within it and a bunch of questionable ingredients. Please feel free to share your thoughts on this topic in the comment section below. Thank you to Abi (Essential Care) & Tamara (Rainbow Feet) for helping me with my research for this blog post. Another interesting post Sarah. I am still learning about organic and natural skincare, so this has given me more things to look out for. Though I am not really strict with it, I have noticed my skin is better the more natural products I use. I do think there should be more laws on it so companies can't say something is organic when its not. Brilliant post Sarah. I was actually thinking about a similar topic and considering a blog post on it myself. I thought that there are so many "natural" beauty brands out there - when you look at the ingredients of some of them you realise they are not that natural at all, but seem to get away with branding themselves that way. This angers me a lot and I think there should be strict guidelines on this, esp as consumers are seem more and more keen to use natural/organic products over synthetic products. Thanks for sharing Grace & glad you have found this informative. It's a complicated issue because on one hand you have to look at those claiming to be natural & then you have judge whether organic claims are justified. There are some good brands out there who use 100% organic ingredients but are not certified but consumers need aware that some are not using a large quantity of organic ingredients but their marketing is based around being organic. Fantastic post Sarah! Very informative. What a great post, thank you very much! I have just started my own blog about natural and organic products and I looking forward to share opinions with all the bloggers and readers so to learn more about this subject. Great post! I hear this a lot also--many people seem to think that if a label says "natural" there must be no harsh chemicals, or if it says "organic" it must be 100% pure. Educating yourself is important, because the companies certainly will not do it for you!! Thanks Evelyn & I agree with you about maybe stopping companies branching out. It can be very confusing for the customer and understanding the different association standards for qualifying as organic products. I understand that smaller companies struggle with certification costs etc. Getting ingredients out of people is hard enough getting them to prove organic ingredients can be impossible. If you are doing this for customers then I salute you. When I wrote this it was inspired by a company who call themselves Organic in their company name but products contain 1 declared organic ingredient which I feel is rather misleading.